Obama: If You 'Work More, You Should Get Paid More' : The Two-Way Announcing he intends to change the rules governing overtime, President Obama said Americans have "spent too much time working more and making less." 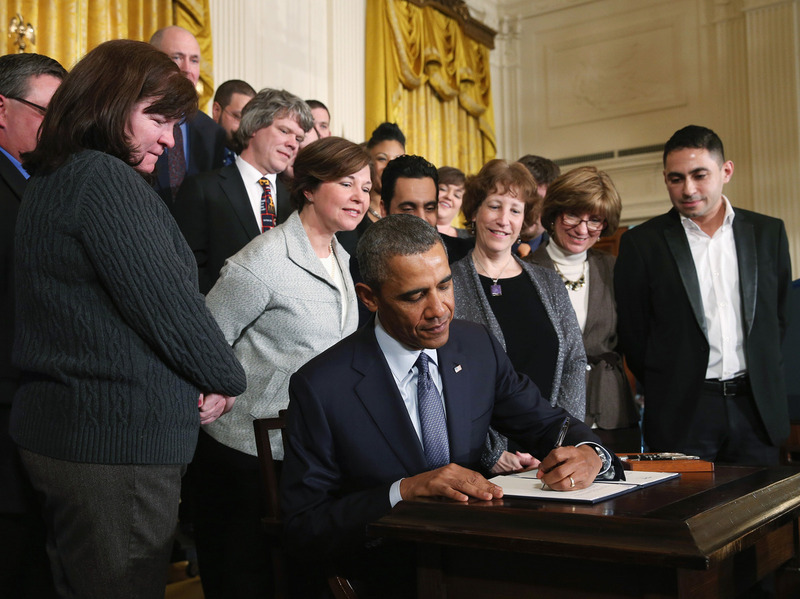 President Obama signs a memorandum for overtime protections for workers, at the White House on Thursday. Flanked by a cadre of salaried workers, President Obama signed a memo directing his labor secretary to rewrite the rules governing overtime in the country. "Americans have spent too much time working more and making less," Obama said during comments preceding the signing ceremony. Obama's proposal would rewrite a commonly used exemption in which a salaried worker designated as "executive, administrative and professional" is denied overtime if he or she is making more than $455 a week. "As a result, a 'supervisor' could earn as little as $24,000 a year, while working well beyond 40 hours. In some cases, such a worker might put in enough hours to end up getting paid — in effect — less than the minimum wage. "The administration points out that the $455 level set in 2004 would be worth $553 today, after adjusting for inflation. "Supporters say an update of that $455 pay level and a rewrite of the exemption rules could have a fairly large stimulative effect by giving workers more money to spend." During his remarks at the White House on Thursday, Obama did not make the economic case. Instead, he said the rules as they are written are "not fair." "If you have to work more, you should get paid more," Obama said. He said Labor Secretary Tom Perez will consult with employers and employees to rewrite the overtime rules. As Mark reported on Wednesday, "critics, including many who represent business groups, say such an action would increase businesses' costs and discourage them from adding workers."